Kliph Nesteroff: We touched on your famous Ed Sullivan impression. 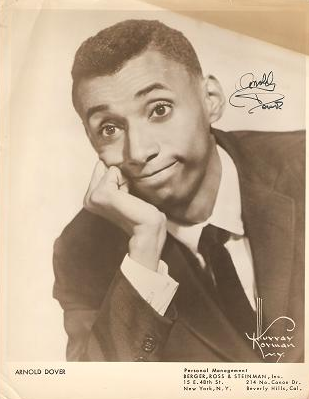 Will Jordan: I first imitated him in 1953 on his show. I had done many, many TV shows. I even had my own little crummy show here in New York in 1953 also. It didn't go over well. 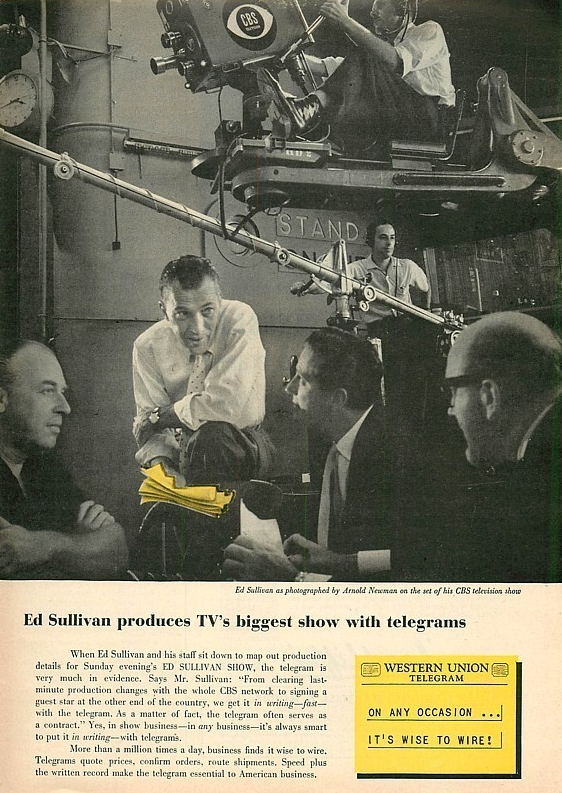 Most of The Ed Sullivan Shows are available - I believe there are eleven hundred hours. That particular show disappeared and now I'm glad. 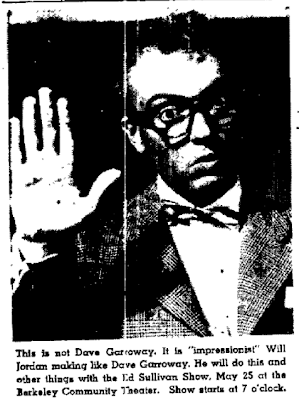 Then I appeared again in June of 1954. By then, the audiences - I can't explain it - the audience wanted me to extend the bit. 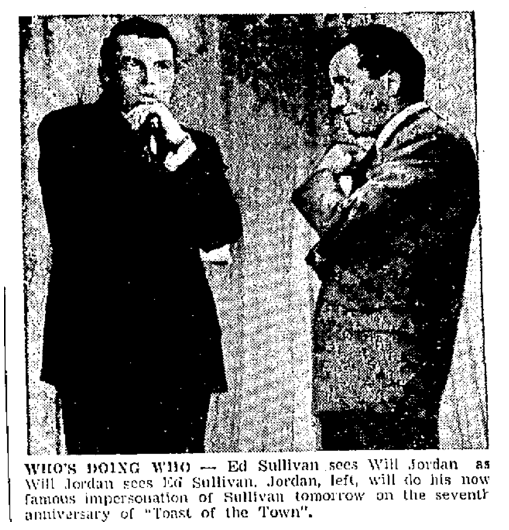 I can't extend Ed Sullivan - he doesn't do anything. So I did what many mimics had done before, but which was not my primary thing. I invented. That's one of the things I resented. 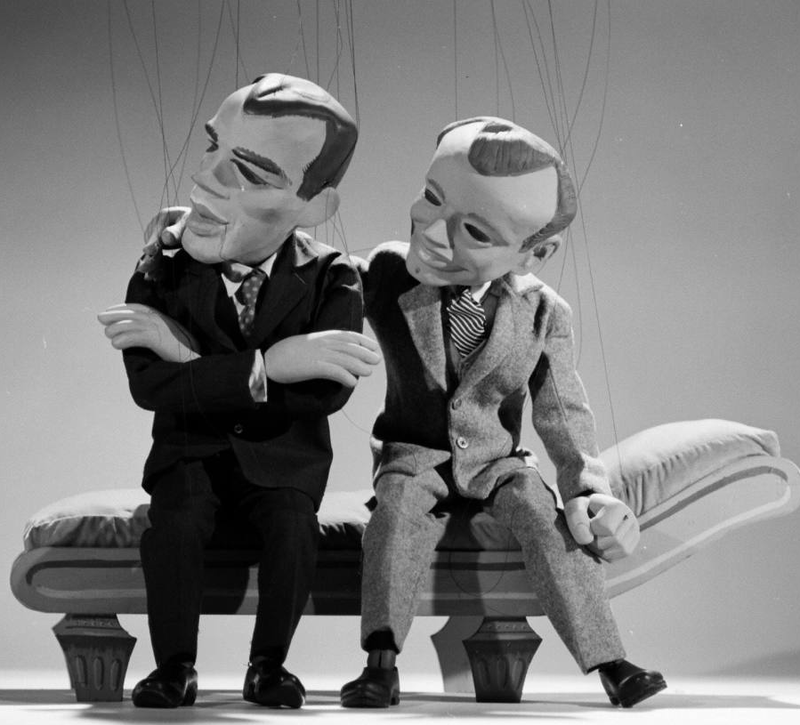 People said that I exaggerated Ed Sullivan. That's not true in my case. I did not exaggerate. I invented the character! He never said, "Really big show." He never cracked his knuckles. He never spinned. That was me. 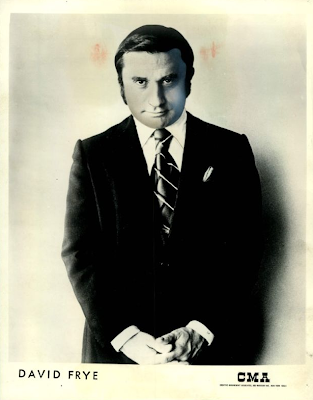 All the stuff that Jackie Mason and Jack Carter stole was stuff that I invented - for the very simple reason that - without that - he wouldn't be funny. Over the years there have been many mimics that have impersonated people - and accurately - but it's interesting. When you impersonate someone who has no mannerisms... then it's up to the comedian to either put the mannerisms in or cash in on the straight impression. Now it works and it doesn't work. In the case of Richard Nixon and David Frye's very famous impression, Nixon, again, did nothing. All the mannerisms you think of with Nixon - most of them are really David Frye! Nixon didn't do anything! None of the shaking or anything. He just spoke in a straight voice. But David invented the [heavy breathing]. That was all invented by David Frye who wanted to be funny. He told me that I was his idol, although I thought he was a much better mimic than me. Then again, it's hard to say because we just didn't specialize. Most mimics have a deeper voice than mine. Guy Marks. Rich Little could go deeper. That did not make them better mimics. But it gave them accessibility to a more deep voice, which is what you needed. I was able to imitate certain deep voices, but not quite the range. We were talking once about imitating Orson Welles. Everybody tried. Nobody did it well. Yet, the public accepted it when Rich Little did it. I never heard a good impression [of Orson Welles]. Will Jordan: That kind of... Danny Gans. Still, he was a nice guy, very good looking. Only one thing wrong. No talent. So there you have another problem you have to deal with. You have to deal with what the public thinks. There's a cynical joke I used to do years ago. It's quite nasty, but it's true. I was talking about Rich Little. They said he has a lot of talent. I said, "His greatest talent is his remarkable ability to convince you that he has talent!" Will Jordan: That's a direct quote from me. One of the few things I have ever said that I am proud of. The second thing that I am proud of is that I invented "Really big show!" That's my expression, not Sullivan's. On the early shows he'd give me credit, but then after a while he just didn't care. He hired Jack Carter and that ruined me! Kliph Nesteroff: I had heard that the reason Sullivan didn't really care after a while and would hire anybody that could do an Ed Sullivan impression - regardless if they were just copping your template - was simply out of narcissism - that he got a thrill out of people impersonating him because it reiterated his stature as a celebrity and an important one. Will Jordan: I don't think you're right in saying anyone. I think the people that did those impressions on the show were people of some prominence. One of the first to do it was a black mimic named Arnold Dover. Robert Wagner went on and said, "I've got this great discovery." I said, "What the hell is this!?" Robert Wagner goes on the Sullivan show and it's this little black kid just doing an imitation of me! The minute you see them cracking their knuckles, you know. 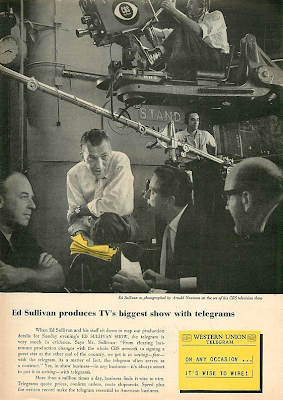 I remember Jack Paar said [during the Paar - Sullivan feud], "I'll have a discussion with Ed Sullivan. Anytime he wants it, he can crack his knuckles!" But he never cracked his knuckles! The only time he did it was when he was imitating me after I first did it! But he didn't spin around and he didn't say really big show! He didn't do anything that was funny! I was the funny one! And I had reason! He was bland! You may ask yourself why don't some of the biggest stars in the world ever have impersonators. I mean, nobody imitated Paul Newman. Nobody ever imitated - I mean, you could go on and on and on. Will Jordan: Because you couldn't find the way to do it to make it entertaining. Will Jordan: At one point I looked like him. Before I did the Sullivan show. In fact, although I didn't originally try to do faces - I did have a talent for that. I found photos of myself taken of me when I am very young in one of those dollar machines. And there I am making the face of Orson Welles, the face of Victor McClaglen, Dave Garroway, Charles Laughton and Jack Benny. But you mustn't confuse that with the voices. The voices were a different thing. In dramatic school I would be given an assignment to do a British accent and in New York we had a theater that would show a tremendous amount of foreign films. This was circa 1944-45. Every day in this theater you would see two great foreign films. I think I learned more about acting going every single day... Grand Illusion and then the next day it would be some other great film and it was great. So when I was asked to do a British accent, I went to see a film that I liked very much called The Seventh Veil. That was really the first impression I ever did. I did it in school and the audience applauded. It was just supposed to be a [generic] British accent. Apparently it was so distinctive that the kids immediately knew it was James Mason - who I didn't think was that well-known. That's kind of what set me on the trail and then of course seeing Larry Storch. 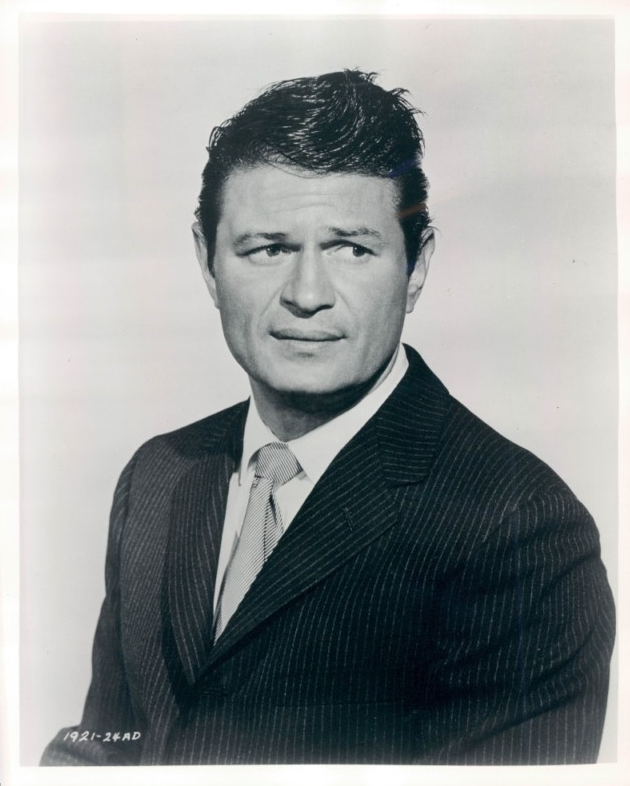 Larry Storch did a great James Mason too, by the way. But I had a tough time. Those amateur nights. Everything I did - bombed. For years. But I had no talent in any way. I didn't know sports. I was not very good in school. I had a brother that was a super genius. My life was a complete mess. I was a failure at everything. I couldn't get girls. I was physically a mess. The joke was that I failed gym. But when I did the impersonations and the comedy - in the very beginning I did not do impressions primarily. 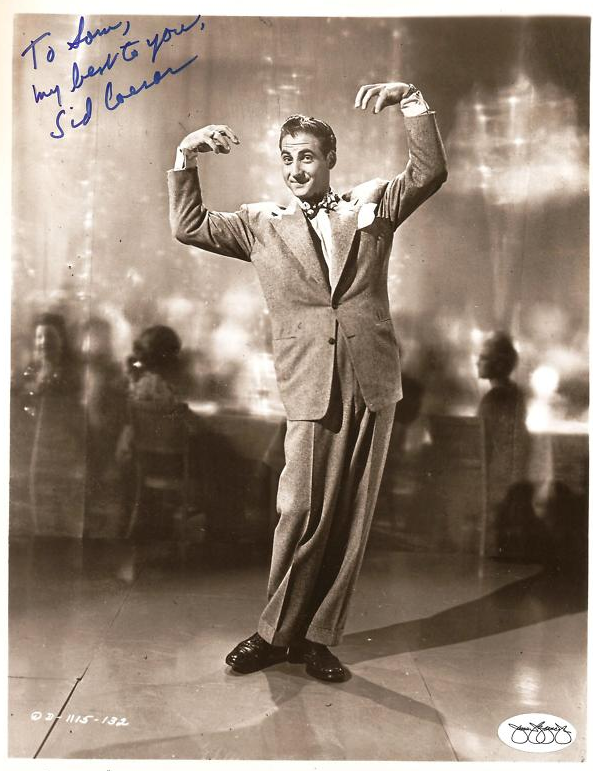 I did routines with sound effects - very, very much like Sid Caesar. Then when I saw Tars and Spars with Sid Caesar I said, "I'm through!" Because he was doing what I do - but much better. Then later, in 1958, I saw Jonathan Winters. Ha! Forget it! He did sound effects that were great. Although, he wasn't quite that good as a mimic. Neither was Sid Caesar. They were okay. But not quite in the top class with somebody like Guy Marks. 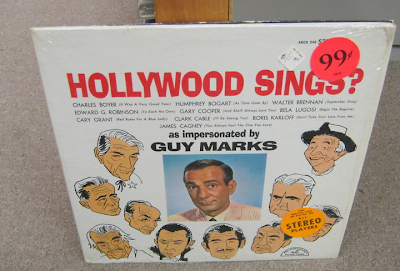 Guy Marks, like many of us, ninety percent of what he did was not that good. But then he would do something extraordinary. Guy Marks I'm talking about now. 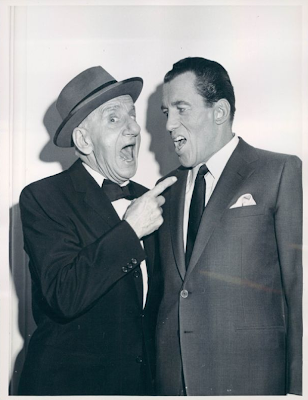 Mario Scarpa that is - and a good friend of Joey Bishop's. He would do an impression of Gary Cooper that was extraordinary! It was one of the best impressions of anybody done by anyone. His Humphrey Bogart was unbelievable. I've never seen either of those two people impersonated by someone better - ever. Nobody came within miles. It was partly because he had the ability to make the voice deep, but like I say, that did not make him a great mimic. But when he imitated Bela Lugosi who was a bass - he had the facility, but not the talent. Impersonation is not just the muscles in your throat - it's the ability to shape the sound. People have the misunderstanding that mimicry is speech. It's not speech! There are a million that do dialects. There aren't that many mimics. Mimicry is mostly the ability to change the muscles in your throat to sound like someone. That's what Rich Little had - except that his ego was unbelievable. He did one hundred bad impressions. He was my prodigy. I got him started. He never thanked me or tried to repay me. He stole my routines about the walks and showed it to John Wayne! I was the first to do the routine about the way actors walk! 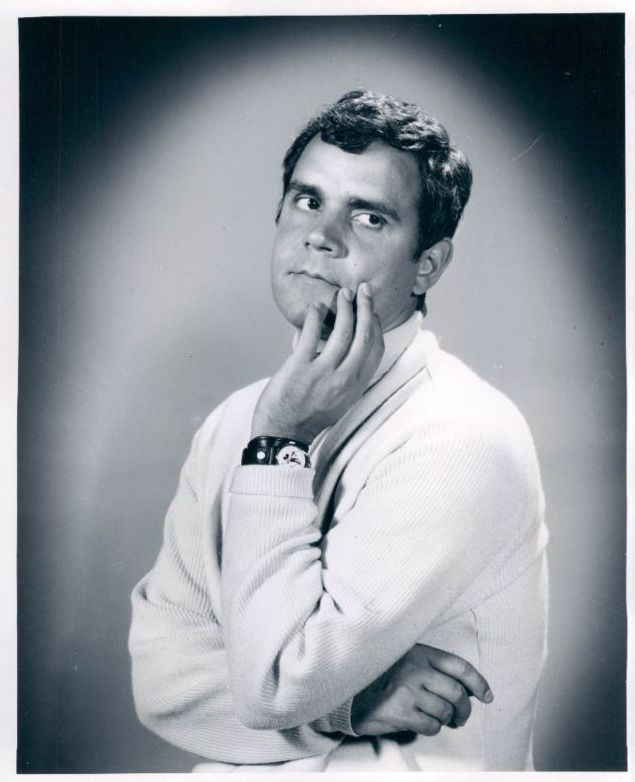 Rich Little is not inventive. A great Xerox machine with the greatest career of all. He is just a big thief. Great interview; a breezy read! Jordan's take on "prodigy" Rich Little was most surprising, but his observations are (mostly) on the mark. You ought to consider interviewing Little for a rebuttal! Arnold Dover? I never heard of him...and I'm shocked that I haven't. I thought I remembered them all (like the great comedian Timmy Thomas... "oh yeah", etc.). But I cannot for the life of me remember Arnold Dover. Anyhow, getting to this interview. What comes first to mind is "chip on his shoulder." Boy oh boy does Will Jordan have some chip on his shoulder. To him, he was inventive and everyone stole his ideas. I'm not certain that all his observations on are the mark at all. I feel the same way about Jack Carter. My feeling is that both Will Jordan and Jack Carter were not great comedians. 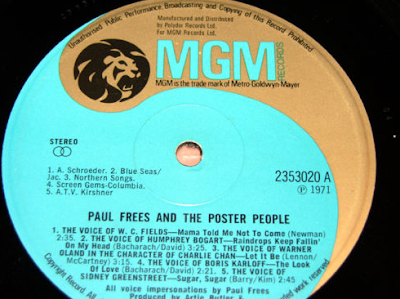 Don't get me wrong -- they were good -- but not exceptional -- the way that, say, Jonathan Winters or Jackie Mason were. Jonathan's mimicry and characterizations were brilliant. 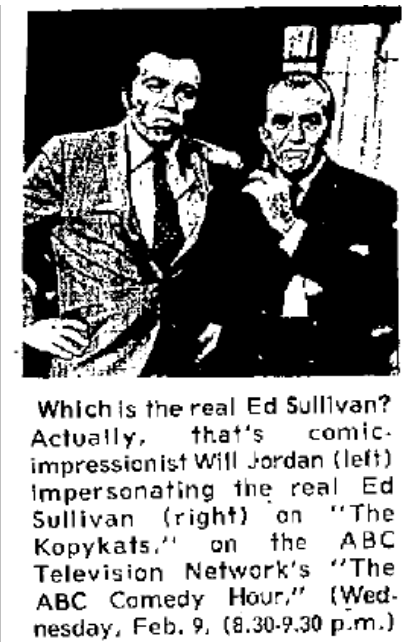 And Jackie Mason's impression of Ed Sullivan was much funnier than Will Jordan's. Jackie took it to another level. And you certainly couldn't put Will Jordan in the league of a Buddy Hackett or a Shecky Greene. I read this interview and actually feel sorry for Will Jordan. John Byner and Frank Gorshin had better routines than Will Jordan did. Comedians do steal, no doubt about it. Johnny Carson's Aunt Blabby was a total ripoff of Jonathan Winters' Maude Frickert. Winters even said it. But you get over it. But Will Jordan comes across as a very embittered man, IMHO. But it was another wonderful inteview just the same. Mr.Jordan also played Ed Sullivan in the 1978 Bob Zemeckis movie "I Wanna Hold Your Hand", in long shots. He did manage to plug a funny comedian named Will Jordan, in Sullivan's voice. It's interesting reading Will Jordan's remarks about how the Ed Sullivan impression is built but one thing he doesn't say is brought out in the clip that's embedded here where you see Ed introduce him. I remember once seeing someone - maybe it was George Carlin - doing Ed Sullivan and he said he does the "John Byner Ed Sullivan" which meant that it wasn't about the mannerisms but rather the outrageousness of the acts he was introducing. Case in point: Ed's *actual* introduction of "going out to the coast to present Jayne Mansfield making her violin debut before the country." chip on his shoulder is right, he sounds very bitter. 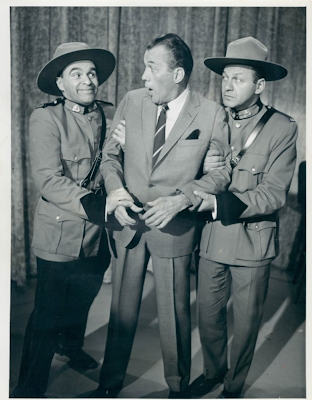 An Interview with Sherwood Schwartz. His Last.